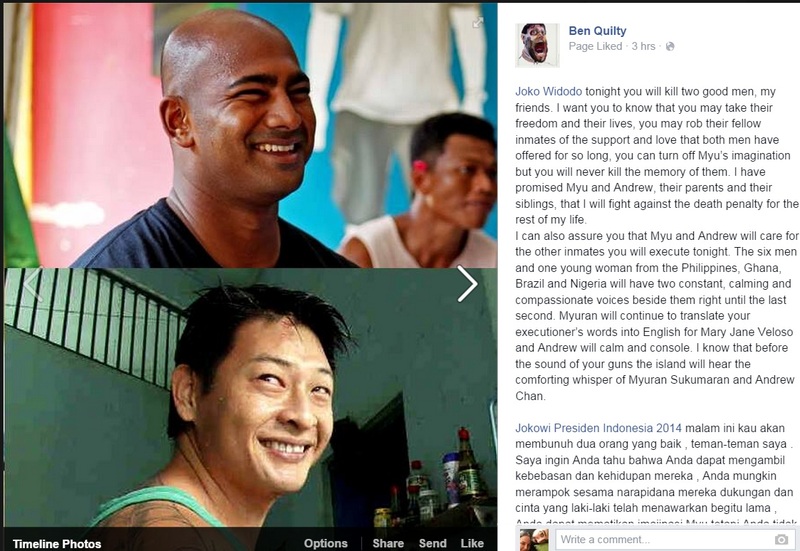 Andrew Chan and Myuran Sukumaran are supposed to be executed by firing squad tonight. By the time this post is read they may already be dead. I write these words after this story has played on my mind for some time. My heart feels heavy thinking about the families and friends of these men. I cannot even imagine what it would be like for the men; to wait in hope for a decade only to watch every attempt to save their lives fail. They are not the only Australians currently on death row and they are certainly not the only people on death row. What they are is familiar to us. The story of their crime and arrest along with the rest of the so called “Bali 9” was enormous news at the time it happened and their subsequent sentencing and plight has been kept in our conciousness by the media for the last 10 years. They are the faces of something too horrible for many to accept- The death penalty. I can’t think why they did what they did. They chose to smuggle drugs in a country that punishes that crime with death. Many argue that they knew that; they’ve made their proverbial bed. I can see that point of view. It seems pretty simple- but it is too simple and doesn’t take into account that this issue is bigger that Andrew Chan and Myuran Sukumaran. There is a part of me that feels that way, too. But it’s with sad exasperation rather than the self-righteous smugness that seems to so often accompany that point of view. Why does anyone risk this? Surely there is too much at stake? A comment mentioned the amount of people that may have died as a result of the heroin they smuggled. Fair point. I’m not denying that what they did was wrong. Will killing them bring back those that may have died? I don’t want to downplay the crimes they were sentenced for. Smuggling heroin is serious business and I’ve yet to hear of anything ultimately good coming out of it. But should they die for it? No. I don’t think so. They have served a decade for their crimes already. I don’t agree with the death penalty for anyone because I don’t think we have the right to take another person’s life from them against their will. Death by firing squad, the nominated method in this case, is particularly horrifying. In the case of these two men, everything I have read about them discusses how much good they have done while in prison. I believe it’s entirely possible that a person can commit crimes at one point in their life and go on to change. We’ve all made mistakes or done things we aren’t proud of. Maybe not on this scale; maybe worse. Another prisoner set to face the firing squad tonight is Mary Jane Veloso, who appears to have been a victim of human trafficking. Does she deserve to die? There are 9 people set to be killed tonight by the Indonesian government. I cannot support the death penalty in any case. Amnesty International is calling for all countries around the world to halt the death penaly because it violates the Universal Declaration of Human Rights. The thing with it is, if an error is made, you can’t take it back. Innocent people are killed. Death penalties are not a deterrant. This has been shown many times over. The death penalty is discrimanatory, utilised by unfair justice systems and as a politcal tool. Amnesty International explains it well here. I just can’t condone it. This is not my most eloquent post. It has been started and stopped several times. It has been revised, reworded and pondered. It boils down to this: I am as human and prone to error as anyone else and so are these 9 people preparing to be tied to a wooden post and shot in the dark and left to bleed to death- whether it’s seconds or minutes as detailed by a priest who bore agonising witness to the execution of two Nigerians convicted of drug smuggling. I’ve read the accounts. I’ve read the facts. I stand for mercy. ← Are You a Feminist?